Suburban mall to get new to market Amazon store. Seattle, Washington-based Amazon.com is bringing its retail platform to metro Atlanta. A new "Amazon Pop-Up" is coming to Alpharetta's North Point Mall later this year. According to the Amazon.jobs website, the company is hiring for a number of postions at the retail store. "Kindle is the best-selling product in the history of Amazon, and the Device business is one of the most innovative and fastest growing businesses at Amazon. This position will continue to build on that success by educating customers about our devices and ecosystem at an Amazon Pop-Up in North Point Mall, GA."
"You've got Amazon opening brick-and-mortar bookstores and their goal is to open, as I understand, 300 to 400." He later backtracked, saying that the comment he made concerning Amazon "was not intended to represent the company's plans." I contacted North Point Mall management who indicated they were unable to confirm Amazon's plans or an opening, even though the retailer lists the mall by name on its .jobs website. Despite multiple attempts to reach Amazon.com's public relations department, my calls and emails were never returned. Amazon does operate a single bricks and mortar bookstore, in its home city of Seattle, but its larger retail presence is via a small but growing network of "Pop-Up" shops. 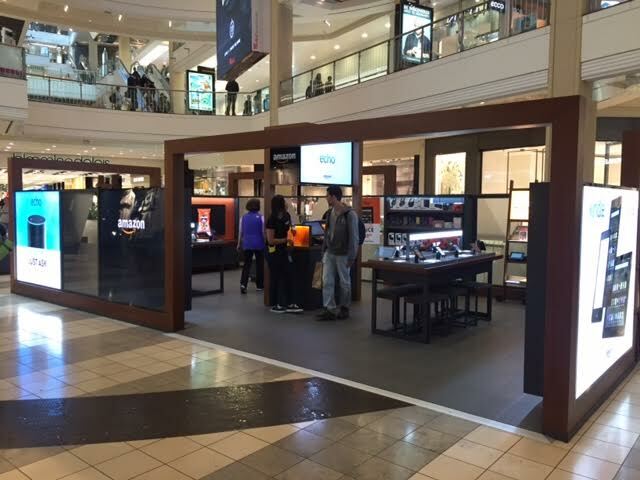 There are currently only a few Pop-Up shops in existence, many at Westfield properties on the west coast like San Diego (Valley Fair), Seattle (Southcenter) and San Francisco (San Francisco Centre). The shop in Westfield's San Francisco Centre, is described on the mall's website as "Amazon Pop-Up, where you can test drive and buy Kindle e-Readers, Fire tablets, Amazon Fire TV, and Echo. Complete your purchase with a wide assortment of accessories, and Amazon gift cards." My brother, a San Francisco transplant, reports that the store is well located, near the main entrance and is often busy. He was kind enough to supply photos of "store" which slightly resemble the format of the Sugarfina at Lenox Square. Almost a hybrid kiosk/store, the space is a large rectangular, in the mall common area. Despite the "Pop-Up" name, hinting at a short term stay, a sales associate I spoke to by phone at the San Francisco "Pop-Up" indicated that his store and others like it are not "temporary," but "permanent." This terminology would seem to indicate that Amazon corporate is pleased with its retail efforts and may be preparing to launch even more "Pop-Up" shops. The fact that Amazon chose to open its Pop-Up at North Point, and not Avalon, for instance, speaks volumes to their faith in the mall and the demographics it attracts. Are you excited for the opening of an Amazon Pop-Up store locally? Do you think the company made the right decision to open in Alpharetta at North Point Mall? Where else do you think an Amazon Pop-Up shop could do well? As a big time Amazon user this is sort of a yawn for me. I’ve heard these stores were coming, but not sure I see a reason to visit them. Since I already own a Kindle and a Fire Tablet I’m less likely to feel the need to touch future offerings before buying. However, a lot of folks like to physically touch something before buying, so we’ll se how things work out. I suppose other locations would be the obvious ones like Lenox, Phipps or Perimeter. Also, maybe a location at the Ponce City Market or somewhere else with a more “in-town” location. Amazon has their real estate people at the ICSC conference in Vegas this week meeting with landlords to discuss space. I think the choice of North Point over Avalon has less to do with demographics and much more to do with the fact that an Apple Store is in the mall. I saw what appears to be an Amazon Store coming to Tech on 5th. We are open! Come check us out at Center Court in North Point Mall!